► Can £32k Mustang keep up with Lexus, BMW? There are 3743 miles between Ford’s Flat Rock, Michigan assembly plant and Southampton docks. It’s a trip our Ford Mustang test car completed only yesterday, rolling off the boat and blinking straight into a bleak British winter. There, people with indecipherable accents took it quickly to Essex to park between half-size cars with Coke-bottle engine displacements. Still, at least driving on the left won’t phase it: this Mustang is right-hand drive. It makes it something of an automotive milestone, because while Ford has built the original pony car for 52 years, it’s taken until now for it to give the passenger seat a steering wheel. It’s like Elvis touching down at Prestwick airport in 1960, then deciding he’d hang about for the foreseeable. 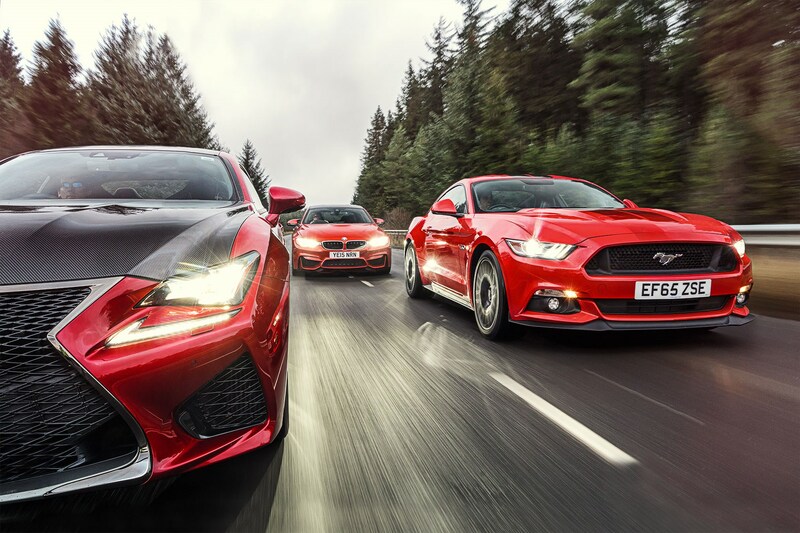 A few hours from now the Mustang will be duelling against the BMW M4 and Lexus RC F Carbon in Kielder Forest on the Scottish borders, headlights flashing over greasy roads, stability control disabled, 19-inch rear rubber gripping and slipping through kinks and over crests, V8 flaring to the redline in a bluster of mechanical violence. I’m not sure that’s the normal running-in procedure, but it’s essential behaviour to discover if a US muscle car costing half the price can beat the best from Europe and Japan. In at the deep end? At least it’s got 200 miles of run-up before taking the plunge. Open the Mustang’s driver’s door and you squidge into broad leather chairs positioned low down that balance the comfort first impressions you’d expect with a degree of lateral support you probably didn’t. The Mustang’s interior seems to have been wrought on the same kind of scale as a Utah salt flat, but its wide-open expanses are punctuated by appealing retro details: ribbed stitching on the door cards, metal-look veneer on the dash, all of it complemented by black viper stripes that relieve the vast plateau of power dome stretching beyond the dash. It’s all quite likeable, but it does create a slightly truck-like XL ambience. Brits can choose from V8s or fours, manuals or autos, fastbacks or convertibles, but the majority of punters have spec’d red V8 manual fastbacks, just like ours. Press the starter button and there’s no mistaking we’ve got the 5.0-litre V8 under the bonnet: it pulses with a subterranean wub-a-wub-wub that evokes McQueen patiently biding time on a stake-out, and rocks the body when you stab the throttle. If you’ve got understanding neighbours, you can even select the Line Lock function: it tips all the brake balance forwards, so you can pin the nose to the ground with a quick press of the brakes, then jump on the throttle and ‘warm the tyres’ – Ford’s words – on your driveway for 15 seconds. Not right now, Bill. Ease down the clutch, slot that manual gearshift forwards, noticing that the short lever and its truncated throw already feels like a Hurst short-shifter conversion, that the big steering wheel’s spokes are too chunky to grip at quarter-to-three, that the throttle travel is long but responds eagerly. With the nose pointed towards Newcastle, initial impressions hit hard and fast. There’s notable off-centre precision from the first millimetre of steering movement, and I like the fizz of texture and the weighting too, especially in Comfort. Likewise, the brake pedal has taut tension and tactile, reassuring feedback. 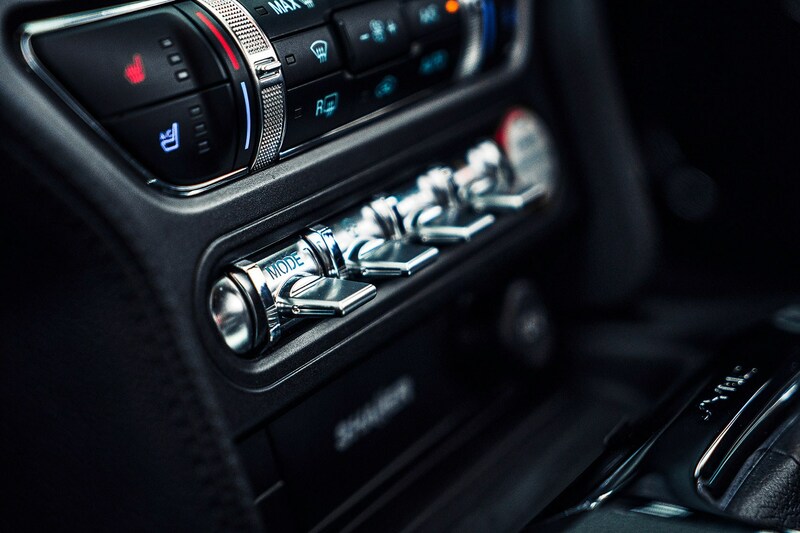 You’d file the Mustang under bit-slower-than-I-thought rather than all-out rapid, but the tailpipe thunder at full chat makes it sound fast, and the seismic crack of a gearshift certainly snares your attention, even if it is hard to finesse for newbies. The suspension – struts up front, multi-link rear for the first time – feels slightly at odds with these scene-setters, its leisurely damping gently ebbing and flowing with the road surface. To call it wayward would be unfair, but it does feel somewhat floaty; makes me wonder how it’ll cope on the twists and flicks where we’re heading. Right now, though, I’ve no complaints: an 80mph cruise registers little more than 2000rpm, road- and wind-noise are muted, and the cushy suspension takes the edge off road craters. The Mustang GT is doing a decent GT impression. Standard kit is generous, the options list as concise as a McDonald’s kids’ menu. Our car gets climate seats, rear parking sensors and Shaker Pro, which bundles an uprated stereo with sat-nav. The nav is a bit of a faff, but at least it’s locked on the A1, not the New Jersey docks, and while the stereo will play Born To Run, it takes other requests too. Reversing camera? Electric-folding mirrors? Rain-sensing wipers? All standard, which means our ’Stang bumps from just £33,995 to a still bite-yer-hand-orf £35,580. 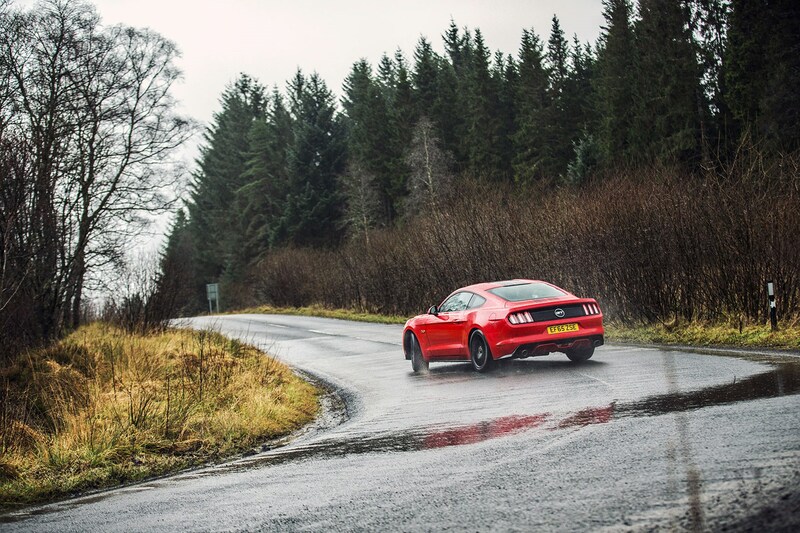 It puts the Mustang at a distinct advantage when it arrives to meet the opposition, rain lashing the fast road that runs alongside Kielder Water. In this context, some of the Mustang’s design detailing feels a little immature, like a Corgi model blown up to 1:1 scale, but for every little flaw, you have to remember that this car is cheap: it’s not a huge chunk of money more than a Toyota GT86, and here it is eyeballing a Lexus RCF and BMW M4. The interior plastics are hard? It’s a ballsy V8 for £34k fercrissake. I’d never driven a Lexus RCF, so I head out before darkness falls. Our car is the Carbon edition, which introduces a carbon bonnet, roof and rear spoiler, alcantara upholstery, Mark Levinson audio, unique alloys and a torque-vectoring diff, an optional upgrade over the regular RCF’s locking diff. But the odds are stacked heavily against the Lexus. Not only is the Carbon £11k and some £34k clear of the M4 and Mustang respectively at £68k, it also went down about as well as a knuckleduster at a Jujutsu class on the press launch. People I trust – CAR’s Chris Chilton among them – criticised a kerbweight some 183kg portlier than the M4’s, and a generally underwhelming driving experience. The RCF was launched on track, and Chris didn’t experience the Carbon – 10kg lighter, £8k costlier than the £60k RCF – but I’ve mentally programmed myself to chime with the negative consensus. And there are things to dislike: dragging the gearshifter from P to D is like tugging a stubborn bolt on a five-bar gate, the infotainment and climate-control interface seem wilfully idiosyncratic, and the ride’s fidgety. Thing is, though, disliking the Lexus is harder than I thought, and you quickly dial into those idiosyncrasies. The seats could be set a little lower, but they’re low enough, and they look gorgeous, with alcantara and leather stretched taut over bolsters that hold you tightly in place. The steering rim is small, tactile and designed to accept thumbs at quarter-to-three. Quick and precise, the electrically assisted helm is light enough to suggest agility, without being over-assisted, and there’s a nice buzz of feel sneaking up from the road surface to your palms. 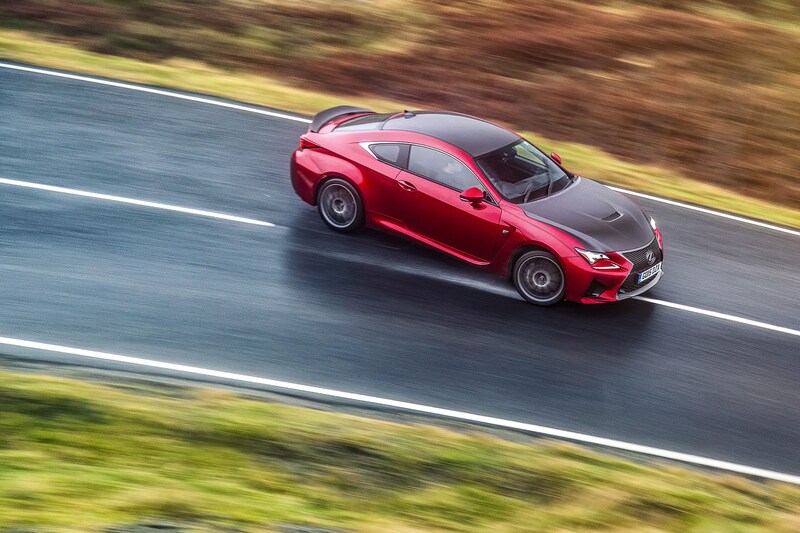 Combined with that firm suspension, it gives the RCF’s front end finger-clicking responsiveness. But it’s all about the naturally aspirated V8. The big 5.0-litre emits a silky restrained hum down low, and the eight-speed auto flicks off ratios without breaking sweat, but the powertrain still packs enough attitude to let you know it has more in reserve than Fort Knox. Wind it past 3500rpm and it snaps to attention, a deep, bellowy honk – synthesised, yes, engaging all the same – that soars to 7500rpm in one lunging climax. It’s intense and frantic and deeply satisfying, like your favourite guitar god just got a longer fretboard. To get the most from the RCF you need to select either Sport S or Sport S+, which flashes up a giant Ferrari-style digital speedo, and ramps up the throttle response. It’s not over-sensitive, but you notice the increased urgency when you tip it in at junctions, and the instant responsiveness brings an enhanced sense of connectivity. When you start to explore the grip limits and feather the power, this is key. 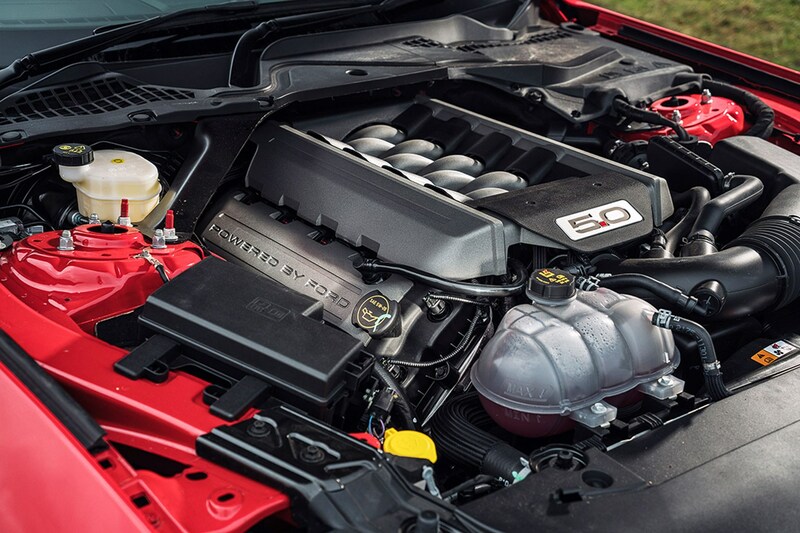 In the larger GSF saloon, its atmo V8 is disadvantageous, because it’s competing against similar-sized V8s with a pair of blowers and a chunk more power. In this company, the RCF flips that on its head: at 471bhp it punches 46bhp harder than the M4 – if 15lb ft down on torque – and it’s 56bhp up on the Mustang. This is not a super-quick car, and you do have to whip it to make it deliver, but it is plenty fast enough and the noise and the interactivity is more than sufficient recompense. And, come on, working an engine is the point. Early next morning, the roads are still glistening wet, the rain reduced to a lighter spray. I head out in the M4, overtaking the logging trucks and dodging the standing water until the road starts to buck and weave and climb above lush evergreens. Of all the rivals, the M4 is the pre-test favourite. It looks squat and muscly in a purposeful kind of way, the driver’s seat is low-set and cradles you securely, and the double-stitched leather and gorgeous fillets of carbonfibre in our car convey the deepest sense of quality. 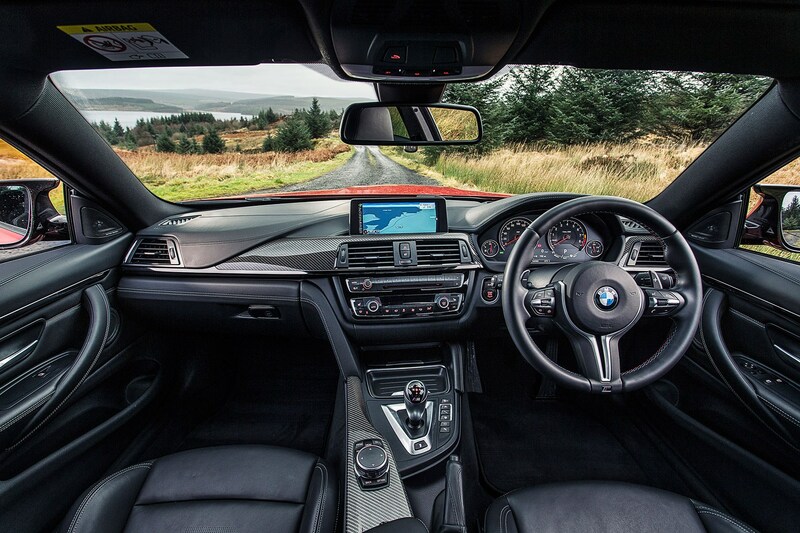 In terms of showroom appeal, as a thing to brag you own, an M4 presses all the right buttons. 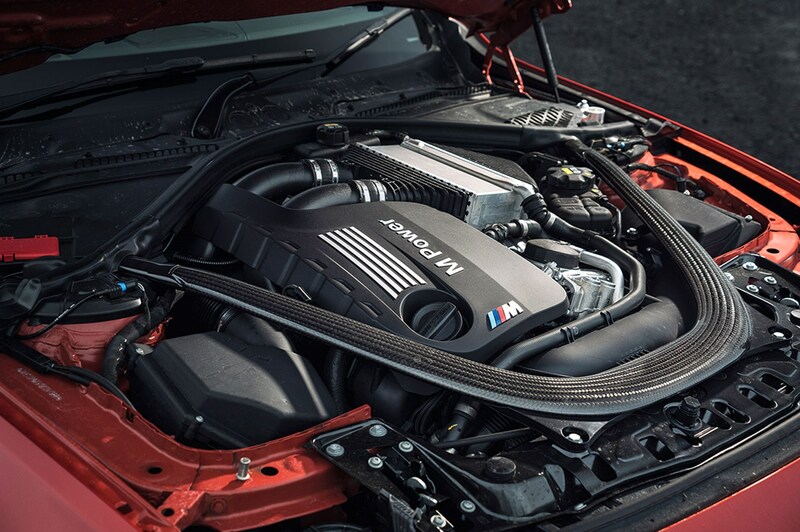 An M car engine letdown? But when I attended the M4 launch nearly two years ago I was underwhelmed by its 3.0-litre turbocharged straight-six. I’m hoping that more familiarity with downsized turbo engines since then, and just more exposure to the M4, will remedy that. So I climb in, almost willing myself to like the BMW. And there is much to like: the steering jinks quickly with slop-free responses, weighting up meatily off-centre, even in Comfort mode. 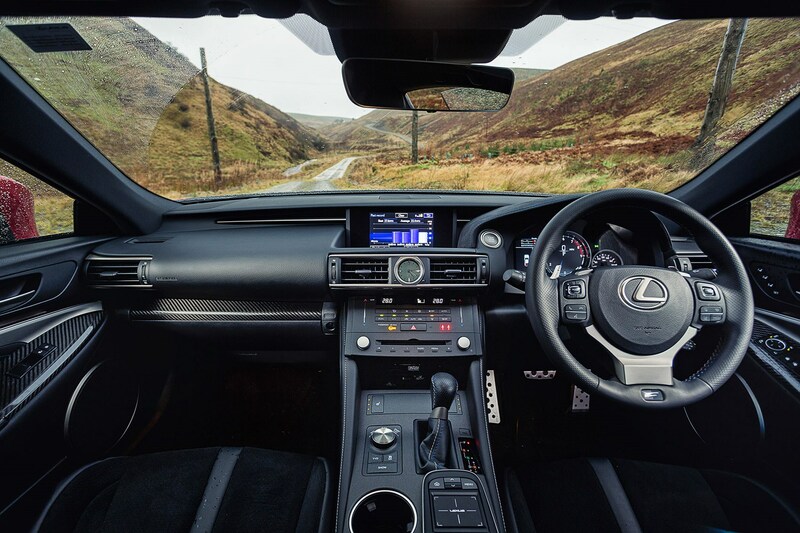 Adaptive suspension smothers bumps far more ably than the Lexus, and with great body control, yet there’s little to be feared from switching to Sport and upping that control still further; only Sport Plus dials out all the compliance. The dual-clutch gearbox is the slickest transmission on test, subtly slipping through ratios in Auto like a bass drum tapping out four-four beats, delivering more visceral clunks of engagement when you click on the paddleshifters. Want to stop like you’ve driven head-on into those logging trucks? You’ll need our £6k carbon-ceramic brakes, which pin the nose to a stop. 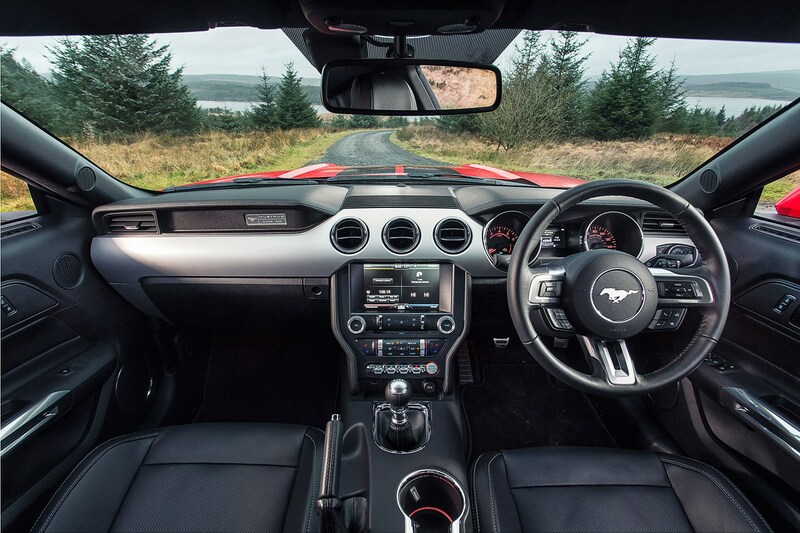 I’d driven the Mustang over the twisting roads that run like tributaries towards Kielder Water, and in the wet and with the stability control fully engaged I’d fully wound on a quarter turn of lock through a fast, third-gear right-hander. It was a wake-up call; the Ford’s limits are low, its electronics Obama liberal. The M4 is much more conservative, with both far more purchase from the front and rear tyres, and less slack in the stability control. It’s a much more sophisticated chassis. But I can’t stop coming back to the conclusion that the M4 is a great car castrated by a bad engine, despite my liking the turbocharged 1-series M, F10 M5 and M235i. Dip into the accelerator and the M4 quickly hauls forward, but there’s also a little lag before the turbos kick. When they do, a surplus of performance washes over the power delivery, a greasy fat gob of torque that detracts from the throttle’s precision and encourages you to short-shift like you’re steering a gutsy six-cylinder turbodiesel. 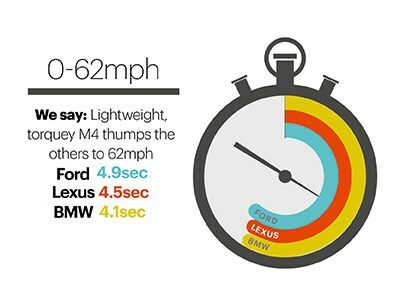 The stats say the M4 delivers its full power impressively 200rpm beyond the Lexus at 7300rpm, but it also delivers it from 5500rpm and the truth is you can see that redline but somehow never get there, like chasing the end of the rainbow. That the M4 sounds gravelly and compression-ignition bassy only adds to the disappointment. When a switch to turbo performance engines became inevitable, we feared for throttle response, exhaust noise,linear power delivery and the precision of controlling a sliding pair of rear tyres with little blips of throttle. Everyone else –Porsche, Ferrari, AMG – has largely confounded our expectations, but the M4 is, for me, the realisation of those fears. What’s happened to rip-snorting induction, to those metallic rasps from the exhaust? To that seemingly endless surge of linear performance and a sky-high redline that made you whoop when you almost clipped it? All gone. 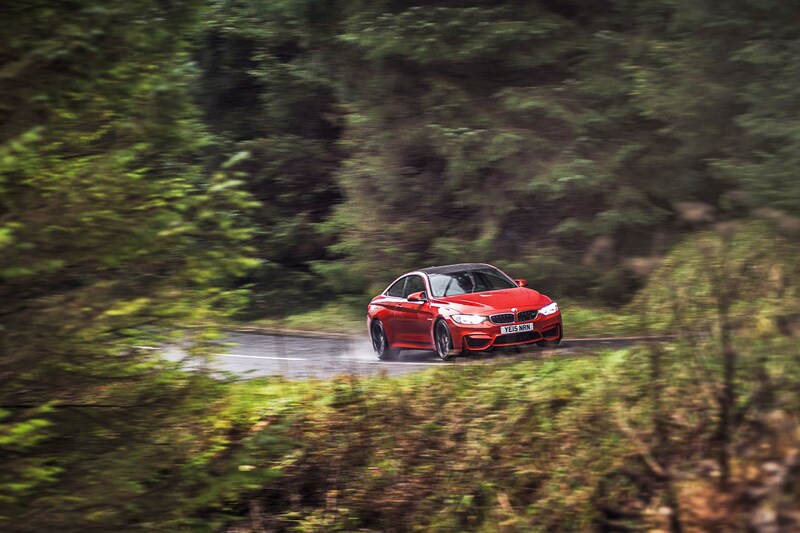 Of course, it’s worse in these streaming wet conditions, where the spikes of torque and a lively rear-drive chassis struggle to happily co-exist – an M4 is much more controllable in the dry – but give me a last-gen V8, any day. Or a Mustang. Or an RCF. 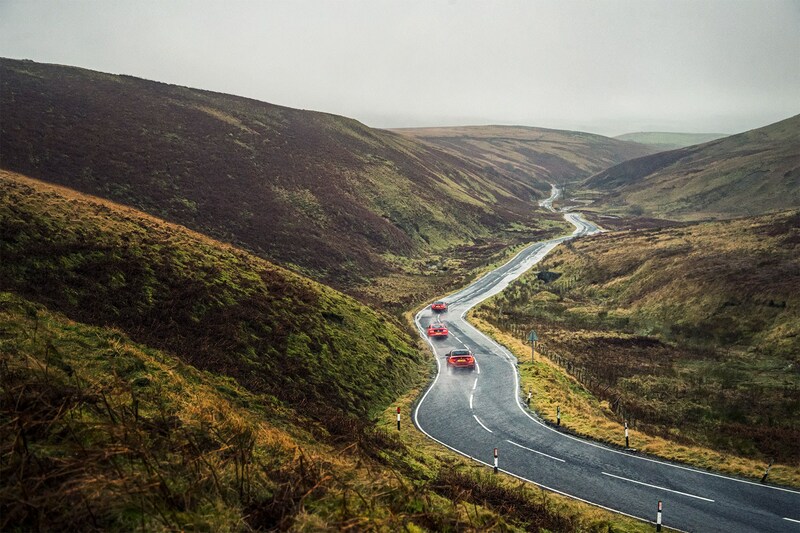 I jump back in the Mustang and take it deep into the more challenging roads that flick left and right below the Kielder dam. It’s huge fun, the compliant suspension not proving the undoing I thought it might. Interesting too to see how the Mustang puts its power down in the wet. Mostly it copes very well, especially in a straight line, where you can really let the V8 loose. But as soon as you start overlapping throttle and steering, you need to be very quick: the Mustang slips into oversteer like the P Zeros have accepted a bung to not even attempt to save it. This might be unwanted at times, but the plus is a linear slip into sideways action, not a fight. Dial into it and you start adding throttle, and soon you’ve got an armful of lock and some old-school muscle-car thunder ripping out of the exhausts. Amazing. The M4 is technically better, and it’s certainly much faster, but the Mustang shows up its German rival’s lack of character and engagement; you warm to it where the M4 can leave you cold. The Mustang is far from foible-free: I’ve got better at smoothing the gearshifts, but the brake and throttle are too distant for effective heel-and-toe, which would help knock the rough edges off those shifts. And when you really start flinging it onto the lockstops, the body can lurch about: it’s crucial to make progressive and confident applications of throttle, not nervy stabs. The Mustang is almost unbelievable value, the undisputed bang-for-buck king, but it also feels like a starting point: I’d love to drive a GT350, something with a stiffer chassis and more power and, who knows, the auto might even be a better bet. No, after two days’ driving I’m coming to a conclusion that even I didn’t expect: nothing ticks all the boxes quite like the Lexus. The RCF’s gearbox can’t compete with the M4’s techno masterpiece, it could be lighter and it could be cheaper, but I find it seriously engaging. It feels like a big decision that’ll probably get me laughed out of the office, so I take it out again, the rain now torrential and streaming off the cambers. And if anything I start to enjoy it more, the way you can unleash every last drop of torque on wet roads with the stability control disengaged – Expert mode, says the dash! – the way you can play with the rear traction with that awesomely precise throttle and tactile steering. Think of the RCF as the place where a Nissan GT-R and a last-gen BMW M3 crossover and you’re somewhere close; the crazy Gundam-robot-like Japanese design, the barking V8, the frisky but perfectly balanced chassis, all of it feeds into a package that feels unique yet somehow déjà vu. Baffled? Don’t be, the maths are compelling: Nissan GT-R styling and tech + previous-gen V8 M3 bombast and exuberance = winner. Looks good, sounds incredible and the ’Stang’s only a small loan more expensive than a GT86. But as a sports coupe it feels more blank canvas than finished article. Hugely desirable and effortlessly fast but – and it’s a big one – the turbo six is really hard to fall for. No charm, no goosebumps, no thanks. 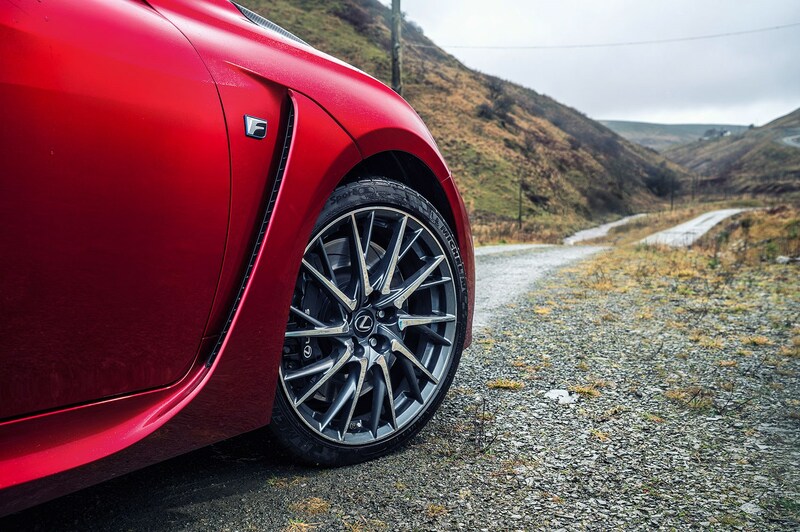 The RCF is based loosely on GS saloon architecture, with high-tensile steel supplemented by aluminium in key areas, including the bumper reinforcements. Body strengthening is key: the cabin’s rocker cross-section is almost double the size of the IS saloon, the front panel is thicker and a centre floor gusset has been installed. In addition, the RCF features underbody bracing: cowl side brace, front rocker brace with more coupling points, rear rocker brace, rear body brace. Body adhesive in panel joints improves rigidity, as does laser-screw spot welding and front and rear screens bonded with high-rigidity adhesive. The M4 is some 183kg lighter than the Lexus RCF Carbon, and no heavier than the E46 M3 that launched in 2000, despite larger dimensions. A carbon roof saves 6.5kg compared with a steel equivalent, the bootlid 5kg, the under-bonnet strut brace 1.5kg. There’s even a one-piece carbon propshaft, which doubles cost compared with the last M3, but saves 5kg. Aluminium also features, erm, heavily, including the bonnet and the forged suspension components, which provide the M4 with its wider track versus a 4-series and increased stiffness. V8 or inline four in your Mustang doesn’t take much thinking about, does it? The (65kg heavier) V8 is £4k dearer, a second quicker to 62mph (4.8sec plays 5.8) and 10mph faster (155mph to the four’s 145mph). Thanks to the four’s turbo the two aren’t miles apart on torque (the V8 peaks at 391lb ft; the four 320lb ft) but the eight’s power advantage is clear; 415bhp to 310bhp. Economy? If you care, the four’s for you: 35.3mpg and 179g/km CO2 versus the V8’s 20.9mpg and 299g/km C02. Mustang gets generous standard equipment, but Shaker Pro pack – satellite-navigation and uprated stereo system with sub in boot – is one of few options at £795. Nav a little clunky, but has full UK mapping. Old-school vibe isn’t tech-free: instruments can display air/fuel ratio, cylinder-head temp and inlet air temp. Select Line Lock, press and release brakes, then accelerate and the front brakes hold while the rear tyres spin for 15sec. BMW infotainment is the best here. 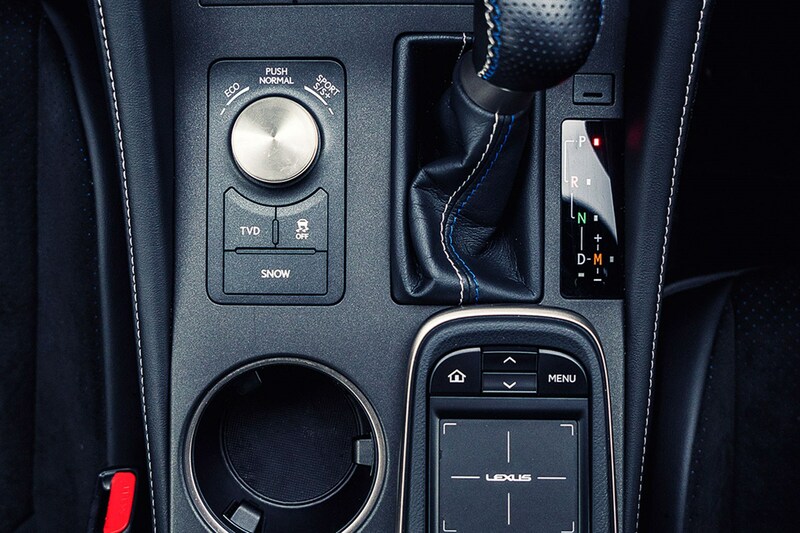 Rotary iDrive controller is supplemented by short-cut buttons these days. Works well, and the top of the controller is a touch pad, so you can scrawl sat-nav addresses with your finger. 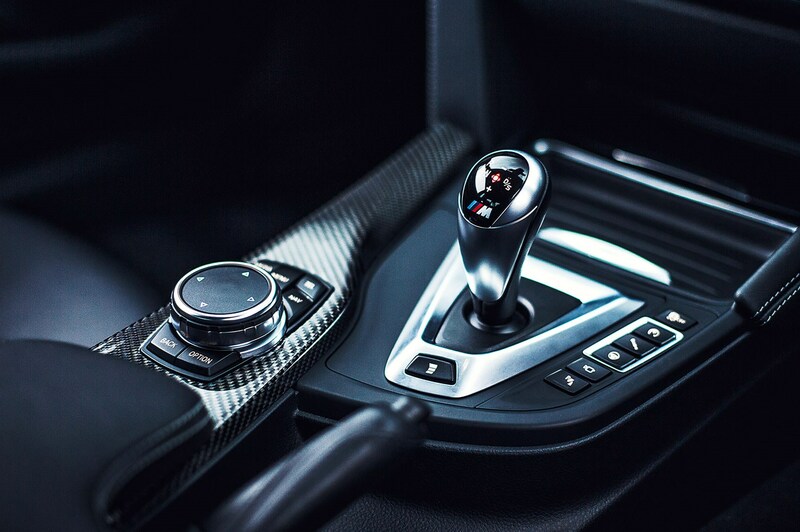 Instead of setting adaptive dampers, steering weight, throttle response and stability control settings every time (all to right of gearstick), store two sets of preferences in the M1 and M2 buttons on steering wheel: one for cruising, one for hooning. Drive Mode Select allows driver to switch between Snow, Eco, Normal, Sport S and Sport S+. Modes tweak air-con, steering weight, throttle response, gearbox mapping and traction control, and adapt the TFT dash display to suit. Optional on standard RCF, Carbon model gets Torque Vectoring Diff as standard, which uses multi-plate clutches to vector torque across rear axle. Press a button to switch between Standard, Slalom and Track.